In adddition to bacterial soft rot, several other root and rhizome rots that affect hostas. These are probably all fungal. Phytophthora and Pythium are two that have been identified and are fairly common. These move through the roots and rhizome much slower than bacterial soft rot, but can still kill the plant if left untreated. 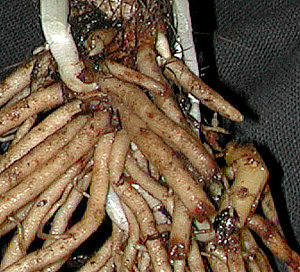 Symptoms are brown soft roots and dead brown rhizome material. Cut away any root or rhizome that does not look healthy. Healthy rhizome should look and feel like coconut meat - any that is soft or tan-colored is dead. Roots should be firm, white, and not pull away. Let dry well in the sun for 20 minutes or so then treat with either Phyton or a systemic fungicide like Clearys 3336. In the Garden: Clean away any affected material, dry in sun for 15-20 minutes and dust cut surfaces with Thiomyl before replanting. In the Nursery: Preventative treatment with systemic fungicides like Alude or Banol that are labeled for Phytophthora and Pythium is usually successful.